Dads are there when you're learning to ride your first bicycle. They're there to help when the homework gets hard. They're there on your wedding day to be your rock. They're even there to help babysit - a job he loves. He's always there when you need him without fuss nor fanfare - and Father's Day is a wonderful opportunity to show your appreciation. So sure, take him out to lunch like you usually do, but this year, why not surprise him with a gift from the heart? We know Dads are often hard to buy for, so here are some awesome Fathers Day gift ideas for Dads of all ages. 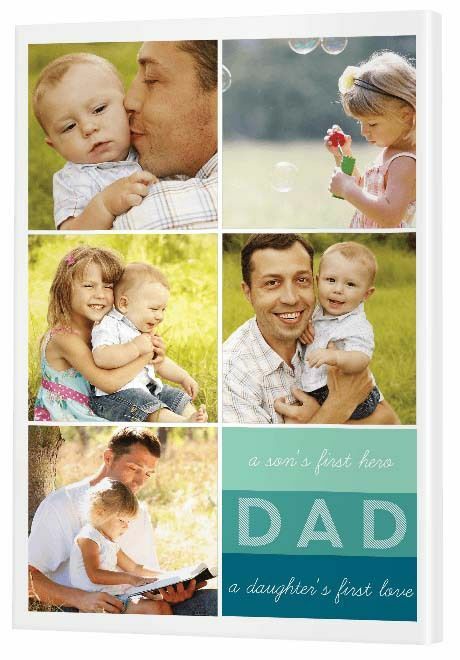 If you want to win his heart, this themed 'Fathers' collage template comes in first each and every time. His little ones are still too young to buy Dad their own Father's Day present, but we all know that's where Mom steps up. Sorry Moms, but this one's up to you! The great thing about creating an online collage is that it can be turned into a fun activity to enjoy with the kids. And they will love it because they get to use the computer! Browse through all the digital photos stored in your family library and invite the kids to pick out the ones they love the best - the ones they think Dad would love to have included in a canvas collage. Sure it's risky business, but remember it's their collage and he'll understand why there's a photo included where he and the kids have food all over their faces. This gift is sure to be one he'll display in his office at work - that's where all his most treasured possessions end up. The message is beautiful too, if you were blessed with at least one boy and one girl. If you were blessed differently, simply use one of our Traditional, Modish or Silhouette collage templates instead. He's officially a Daddy and what a Daddy he makes. Capture this memory on a stunning metal print. Acknowledge Dad's role in his new born's life, printing a loving moment of the two of them together in black and white. Black and white prints look magnificent on metal - pure art really. Use a photo from the hundreds that have already been taken or commission a photographer to capture something truly special. 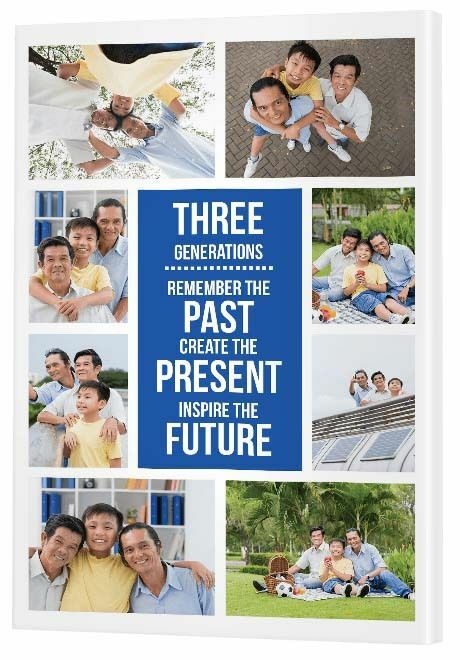 Here's a gift two Dads and two sons will absolutely love, the ultimate 'three generations' photo on canvas. 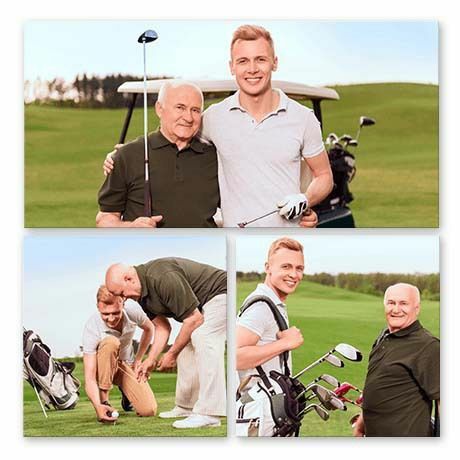 Everyone loves a three generations photo and the boys are no different, so get the rowdy gang together for three times the fun then print the photos onto an exciting collage. This traditional collage has plenty of opportunities for a massive eight photos, with plenty of room in the center for a personalized message. You can choose any words you like, but to easily create this image be sure to try Canva, a tool that simplifies the process of designing a graphic like this. When deciding on a background colour, opt for something bright and bold then keep the font large and legible. If the Dad in your life has been blessed with a daughter rather than a son, well it's time to mix things up a bit. Nothing wrong with that! The bonus with this template is you can write absolutely anything you want in that center space, so there's no need to limit yourself to this idea. The even better bonus with this gift is you can kill two birds with one stone. Print this same print twice and, on Father's Day, give one to Dad and one to Granddad! Take Dad away on a holiday everyday with a beautiful split image print of the view from his favorite destination. Does Dad have a holiday house? Or simply a special place he loves to return to year in, year out? This gift is about bringing a piece of that peace home for him to enjoy, no matter what time of year it is. 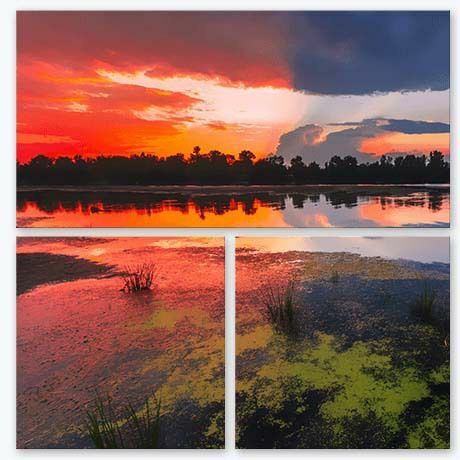 Printing on a split image canvas is a wonderful way to magnify the natural beauty of a scene, so if you have access to some landscape photography of his home away from home then that's the way to go. The daily grind can sometimes be tough. This is a reminder of the fruits of his labor - well worth the effort in the end. There is a way to give Dad all his favorite things for Father's Day and it doesn't have to cost a fortune. Then source images of these various items and activities to create an awesome collage of all his favorite things. Don't forget to include photos of the family - you (his lovely wife) and them (his beautiful kids)! This modish design has an abundance of frames to fill - 17 to be exact. In fact, in our range, it's the collage with the most frames. The bonus is that 17 frames costs the same as a canvas with one frame, so you get to display a bunch of different photos in a really effective way while remaining affordable. The wonderful thing about this collage idea is that, once you've filled it, it actually ends up looking more like a work of art than a 'family portrait' as such. You can even repeat a few of the same photos across the design to give it a further artistic style. Either way, Dad will appreciate the inspiration this gift brings him. He's just a big softie, afterall. New Moms get a lot of attention on Mother's Day, but sometimes new fathers can be forgotten. Father's Day is a wonderful opportunity to put together a family portrait that celebrates the journey you've taken together as parents. In this case, the focus is mostly on Dad, but this 'Live Laugh Love' themed collage is more about family than anything else. 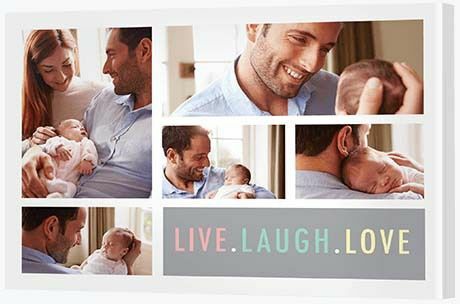 Celebrate your new family by collecting a number of photos of Dad with the new baby and include some photos of his other loved one as well - you. There was an amazing collection of photography taken of you and your father on your wedding day. It's time to honor that relationship! Recently married? This Father's Day gift will surprise and delight your Dad. In fact, it may make him teary all over again. The idea is to build a glass wall display of photos of those special moments you shared with Dad on your wedding day. The large frame provides a space where you can include a quote from the heart. "Daddy, of all the walks we’ve taken together, this one is my favorite." And then include your name and the date of your wedding. You can create this design using a tool like Adobe Photoshop or, if you're not great with graphic design, the online Canva tool will enable you to design something suitable. What's more heartwarming than a child bringing home a piece of their own artwork from kindy? Giving it the pride of place it deserves! 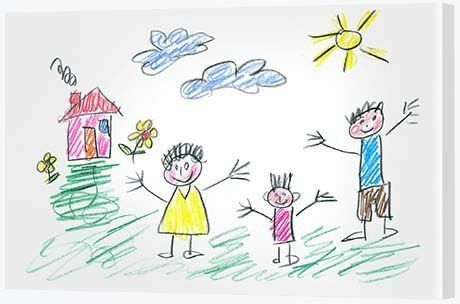 Little Johnny might bring home a different work of art multiple times a week, but there's one stand out piece that Dad absolutely loves. Give this piece the respect it deserves by scanning it in as a high resolution digital file then printing it to canvas. 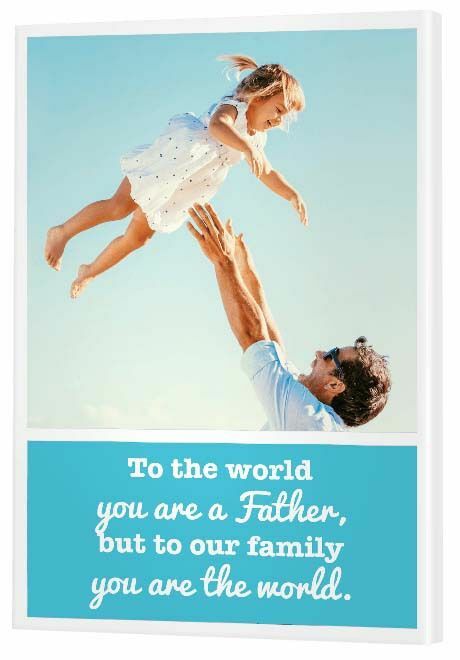 If you want a whole world of personalized gifts available to you for Father's Day then you will love our online CanvasApp. 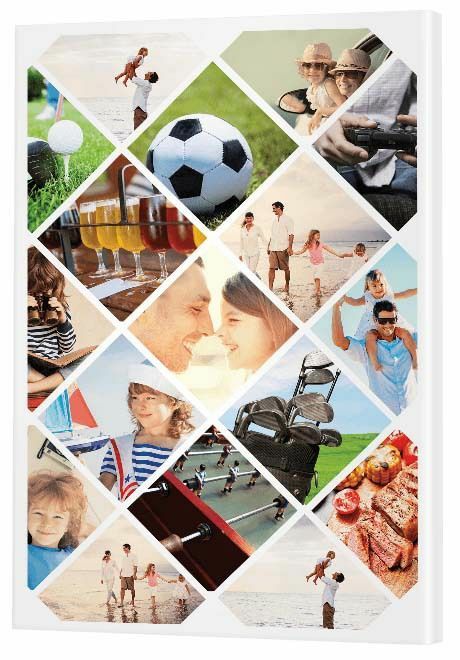 Collages open up a whole extra world of personalization possibilities as they let you fill a number of different frames with whatever images you choose. A range of collage templates can be found in four key collections: traditional, themed, modish and silhouette. This simple two-panel design, featured, is part of our traditional collection. Even a simple design like this gives you the opportunity to include a 'hero' photo and then a personalized message. A hero photo is simply one of the most favorite photos you have in your personal digital library. Pick something your father or your child's father will love the most. It could be a photo with his kids or grandkids or perhaps a photo of the whole family. To create the exciting frame underneath, visit Canva and create a design there choosing whatever words you like! Choose a background color to match a color that appears in the hero photo. It's amazing how much impact that one design trick can make. Download the image from Canva, save it as a jpeg or png then upload it to the CanvasApp. He'll love it! 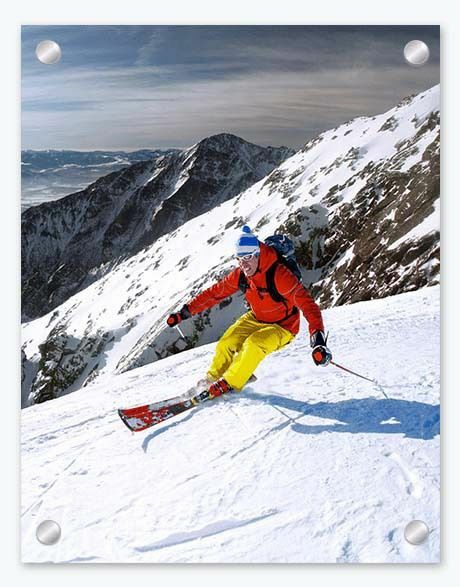 If your Dad loves an adrenaline rush then an extreme sports print on glass will keep him on his toes each and every day. Bright ocean and fresh snow photos looks amazing when printed on glass, providing a fun, fresh, exciting feel. There's something about a high quality acrylic glass finish that brings a room to life, fantastic for Dad's office or man cave. Dads with an adventurous spirit will absolutely love a professional print of their favorite activity, a reminder of all they have to look forward to when the grind is getting them down. To find a dynamic print, visit our Sports/Leisure Collection in our Canvas Art library. Pick a shot your Dad will be most inspired by and print it onto stunning glass. It may very well give him the new lease of life he's been looking for. 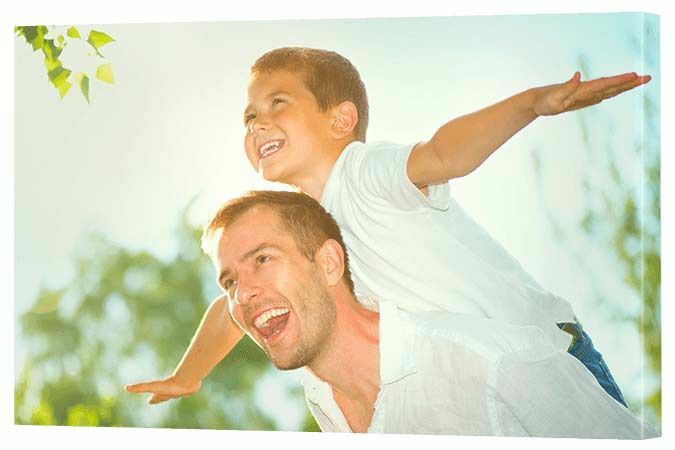 Surprise Dad this Father's Day with a gift that acknowledges that special lifelong bond between father and son. As we get older, it often gets harder to find gifts for our fathers. Gone are the days of hand-made cards. Often we shout Dad to lunch and beer at the pub and that's about it. He's not fussy. He loves a good pub lunch. However, if you really want to give a gift with meaning, try a canvas wall display. Think of the things you love doing together - it could be going to the football, playing golf or bushwalking. Whatever hobby you share, capture it on camera and print it to canvas. This is one gift he won't be able to help but love. He may tell you that you "shouldn't have", but he will feel truly appreciated. And every good Dad deserves that!